Write-Host -ForegroundColor Red "Requires PowerShell v.4 or greater. Please install the Windows Management Framework 4 or above." $logonResponse = Invoke-RestMethod -Method Post -Uri $logonUri -Body $creds -ContentType "application/json"
$groupOutput = Invoke-RestMethod -Method GET -Headers $header -Uri $requestUri -ContentType "application/json" -SessionVariable "theSession"
$serverProperties = Invoke-RestMethod -Method GET -Headers $header -Uri $requestUri -ContentType "application/json" -SessionVariable "theSession"
Write-Host -ForegroundColor Green "  PowerState: $powerState"
Write-Host -ForegroundColor Yellow "  Pausing $serverName"
$servers = "[ ""$serverPause"" ]"
Write-Host -ForegroundColor Green "Sending Server pause request for $serverList"
$pauseRequest = Invoke-RestMethod -Method POST -Headers $header -Uri $requestUri -Body $servers -ContentType "application/json" -SessionVariable "theSession"
The following sample script will retrieve your Group ID from an existing server. 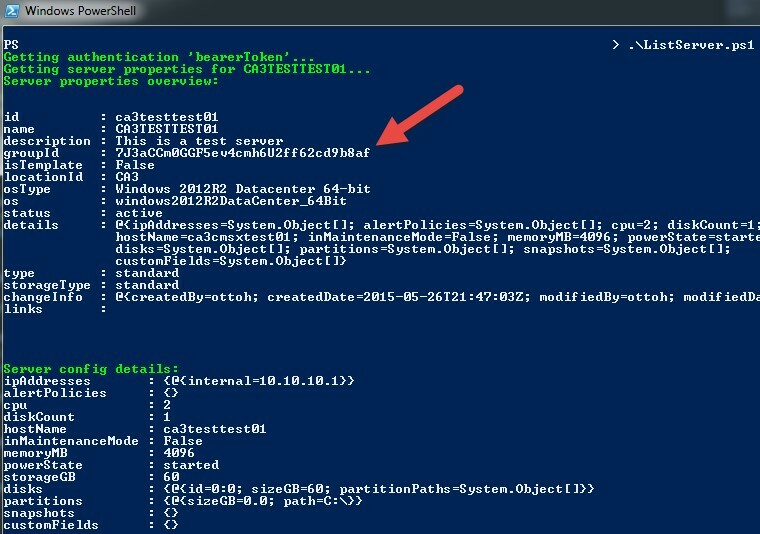 You will need to incorporate your specific server name in this script (we use ‘CA3TESTTEST01’). $logonResponse = Invoke-RestMethod -Method Post -Headers $headers -Uri $logonUri -Body $creds -ContentType "application/json" -SessionVariable "theSession"
$deployCapabilities = Invoke-RestMethod -Method GET -Headers $headers -Uri $RequestUri -ContentType "application/json" -SessionVariable "theSession"
The following is a rule that can be imported into Task Scheduler to run the above script on a regular basis.